My wife has places to go. Quickly. But I like to take my time and enjoy the scenery. Webster defines compatibility as “the capability to live together in harmony.” Our culture highly values compatibility in marriage, but the common belief is you must meet the right person in order to attain this. If you find “the one,” harmony will naturally ensue. 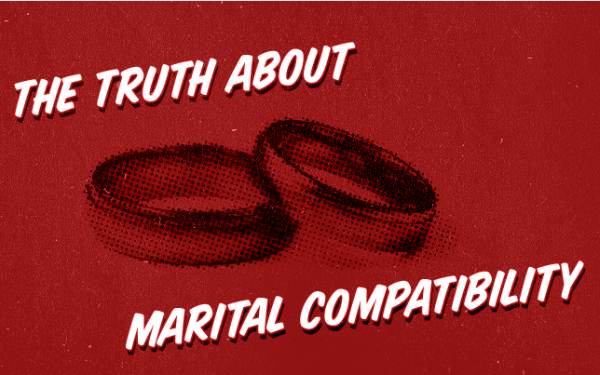 The Bible, however, teaches that harmonious marriages are anything but natural. Since the Fall in Genesis 3, sin makes us incompatible as relationships became naturally strained and fractured. But the Gospel gives us hope to live in accord with others as Jesus reconstructs relationships. We become others-focused instead of self-focused (Rom 15:5). So, what specifically does the Bible say about finding a compatible spouse? A true Christian should marry a true Christian (2 Cor 6:14, 1 Cor 7:39). That’s it, but that says a lot. Instead of finding a compatible mate, Christians are instructed to marry another Christian and become a compatible mate. Transformation requires the grace and power of Jesus – good news to those seeking marriage or those already married, as God does not leave change to our efforts. 1. How do you know he or she willingly submits to godly authority? Ladies, if he does not submit to godly authority, he is a dangerous man. Period. Men, if she doesn’t submit to godly authority now (as a single man, that’s not you by the way), she is the kind of woman Proverbs warns you to avoid. 2. How do you know he or she is teachable? If he or she likes to argue, they are more concerned with being right than being made righteous. When you think you’ve won an argument in marriage, you’ve actually lost. Marriage is about humbly maturing, realizing you have much to learn for the rest of your lives. 3. How well known and involved is he or she in Christian community? It’s easy to put on a good front when you are attracted to someone and motivated to marry. If he or she is unknown in community, they are unknown to you. Others need to vouch for the person’s character, integrity, and faith. 4. How does he or she speak of others? If he or she is critical, demeaning, or flippant in their attitude and words now, it will happen in marriage. Soon, you will become the brunt of their anger and pride. 5. How does he or she respond when confronted with their sin? When someone tries to hide, misrepresent, blame shift, excuse, or rationalize their sin, they have a distorted view of the Gospel. Because of Jesus, we can confess sin (I John 1:9), repent (Rom. 2:4), walk in the light (Eph. 5:8-9), and be reconciled to God (II Cor. 5:17-21). 1. What do you focus on more frequently, what’s wrong with your marriage or what’s right with it? If you’re a Christian, there’s a lot right about you because Jesus has saved you from God’s wrath and now owns you. You have every resource in Christ available to you (2 Peter 1:3). As a redeemed child of God, forgiveness and grace can flow freely from your heart allowing you to minister to your spouse’s weaknesses. But do you live that way? 2. When is the last time you did something intentional for your spouse? Kindness and thoughtfulness strengthen marriage. Yet many couples feel entitled to speak harshly, be contemptuous, or withhold forgiveness. “For better or for worse” is not permission to sin. It takes faith and humility to respond graciously when you are angry, hurting, or misunderstood. 3. Do you believe God knew what he was doing when he had you marry your spouse? When marriage is difficult it can be tempting to think you made a mistake, forgetting marriage sharpens us, often in painful ways. Step back and remind each other what you appreciate and admire about one another. Chances are, those qualities are still there, but you have allowed sin and selfishness to creep in and cloud your view. 4. Do you need to repent of discontentedness and complaining in your marriage? It takes a supernatural intervention by the Holy Spirit to make us thankful. Our tendency is to compare and complain. Thanksgiving is a lifestyle command in Scripture (Col. 3:15-17), not just a suggestion or holiday in November. What are you thankful about? What would it take for you to enjoy your spouse? 5. Do you and your spouse pray together? Do you pray for each other? It’s difficult to grow hard-hearted and embittered toward someone you are praying for frequently. God will do his best work in your marriage when you are in prayer. Prayer acknowledges our need for God and worships him.